Kitchen Scales have to be one of the absolute kitchen essentials. Whilst I'm usually happy to do a bit of bucket chemistry guestimation for cooking, when it comes to baking accuracy is absolutely vital. I've used digital scales for a number of years now but there is always a panic when the battery runs out and an error message shows. Queue rummaging in the depths of the kitchen junk drawer for the correct replacement battery, which is usually something weird and wonderful. A couple of weeks ago when my daughter was baking Rainbow Fairy Cakes with a friend my old scales gave up the ghost entirely. Even a new battery couldn't bring them back to life. Luckily she managed to borrow some form a neighbour and the cake making could continue but a new set of scales was most definitely required. I've long been a fan of the stylish kitchen products from Joseph Joseph so they were my first stop for new scales. I was impressed by both the looks and concept of their Switch Scale which I've now been regularly using for a couple of weeks. 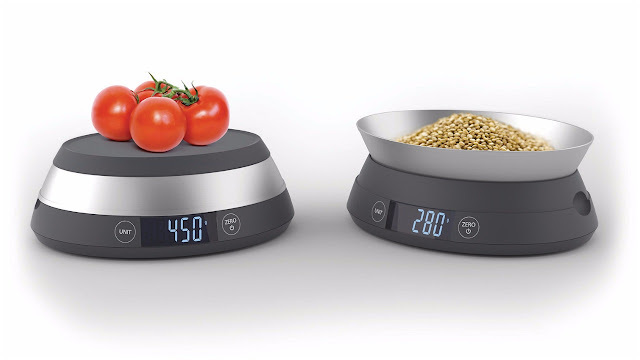 Retailing at £50 these clever digital scales offer two options for weighing your ingredients. 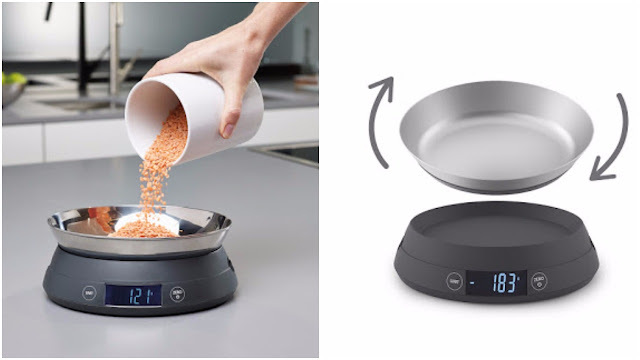 You can either place the items directly onto the scales or flip the top over and it becomes a measuring bowl itself. The internal mechanism of the scale has a two year guarantee and comes complete with 3 x AAA batterries. An auto power-off feature helps to maximise battery life. The SwitchScale™ has an easy-to-read back-lit LCD display and touch-sensitive controls. It works well for measuring both liquids and dry foods and can be quickly switched between gms, lbs, ozs, fl.ozs and mls. Maximum capacity is 5kg/176.4 fl.oz/11lb/5000ml. An ‘add and weigh’ function allows multiple ingredients to be weighed during recipe by zero-ing after each addition. I've found it really easy to use and it looks good in my kitchen. 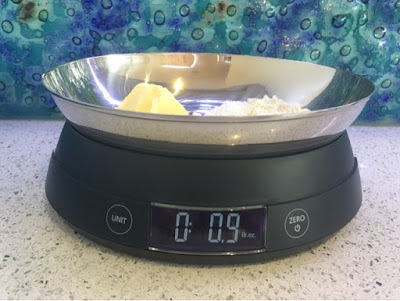 The bowl is hand wash whilst the scales themselves are easily wiped down with a damp cloth. Non-slip silicone feet keep it secure on the worktop. It can also be used with any other receptacle such as a jug or a pan by placing it on then zeroing. My only tiny gripe would be that you need to bend down to view the display from side on rather than above as I was used to with my previous digital scales. Joseph Joseph have provided a SwitchScale worth £50 as a giveaway for readers of Foodie Quine. Entry is via the Rafflecopter widget below. To enter, let me know in a comment "What's your most frequently weighed item?" For additional bonus entries you can follow me on Twitter, Tweet about the Giveaway or like me on Facebook and Instagram. Disclosure: Joseph Joseph provided me with a Switch Scale to review and giveaway. All opinions expressed are my own. Pasta - we eat a lot in our house! My hubby is a type 1 diabetic so we have to weigh all carbs! I could really do with some new ones as they are used so much! As I'm doing Slimming World, it's cheese and cereal for me - two of the only things that need measuring! Flour, butter and sugar - I bake a lot of cakes so seems i'm always measuring these things! I weigh the cat's dry food every morning so she doesn't put on weight. Butter is probably my most weighed item. At the moment my most frequently weighed item would be our 2 dogs dinner. They used to feed out of the same bowl but one of them is getting a little chunky because he is a pig when it comes to food so I have to divide it and make sure he doesn't get more than our other dog. Probably mince meat. I tend to buy packs bigger than I need for a meal. So I tend to weigh it, so I can divide it evenly. I bake lots of cakes so I weigh flour, sugar and butter equal amounts of time. Flour because I make my own bread regularly. Flour or oats, I think! Flour. Thanks for the lovely giveaway, I would love some new scales. I've been really strict with my diet for the last year or so, almost obsessively so... So, I weigh EVERYTHING. From cereal, to rice, pasta... even raisins in my porridge! These would be brilliant. Flour - cakes, pizza, bread . . . we love making them all. Fresh veg, because OH likes to keep a rough tally of what he harvests. For cooking purposes, probably flour. Flour for baking my cupcakes! Peanut Butter - a calorie counters nightmare! hmm most recently it's been strawberries and sugar for making jam. Oh and ebay parcels! haha! Crumble ingredients - so flour, butter and sugar. We eat a lot of crumbles. Probably flour - we use it in most things! Definitely flour for me too. jacket potatoes, i cook them in the microwave oven and have to weigh them first to know how long to cook them for. it has to be flour and sugar!